January 19, 2018, 9:35 AM · Though much of our modern cultural diet is served in digital soundbites and clips, the latest recording from violinist Hilary Hahn is an emphatically analog creation, from its direct-to-disc pressing to its cover art. Sure, you can still get it digitally, on CD or on Spotify, but she's gone out of her way to provide a gorgeous physical object of art in the vinyl release of her latest project, Retrospective, a compilation of selections from her last 12 recordings with Deutsche Grammophon as well as a recent live recital recording. "It was really nice to be part of the process," Hilary said to me Sunday, speaking on the phone from London, where she was performing in a benefit concert for the Refugee Council. She explained that when record companies re-group and re-issue an artist's recorded works, the artist sometimes finds out only after the final product has gone public. Such was the case with Hahn's early recordings for Sony. But in the case of "Retrospective," Deutsche Grammophon enlisted Hilary's input for the entire process. One of Hilary's top requests was: "Can we do a vinyl release?" The answer was, "Yes." Not only did they do a vinyl release, but they chose a challenging early 20th-century recording technique -- direct-to-disc -- to create it. "This was done kind of as an experiment in recording technology, revisiting this direct-to-disc technology," Hilary said. It required her to agree to a live, unedited recording -- a request she welcomed. "I was really curious to try it," Hilary said. "I grew up with LP's and vinyl in the house, so I was thinking, why not go back to the original way? Let's see what that actually sounds like!" 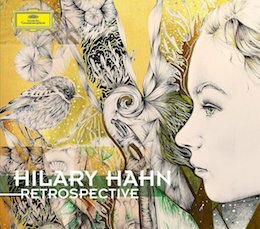 While one of the LPs in "Retrospective" contains the previously-recorded pieces, the other LP features a live 2016 performance of Hilary in recital with pianist Cory (Smythe), performing Mozart's Sonata For Piano And Violin In G Major, K.379 as well as two pieces from her Encores album, "Hilary’s Hoedown" by Mark-Anthony Turnage and "Mercy" by Max Richter. It was recorded the old-fashioned way: directly onto an analog disc master. 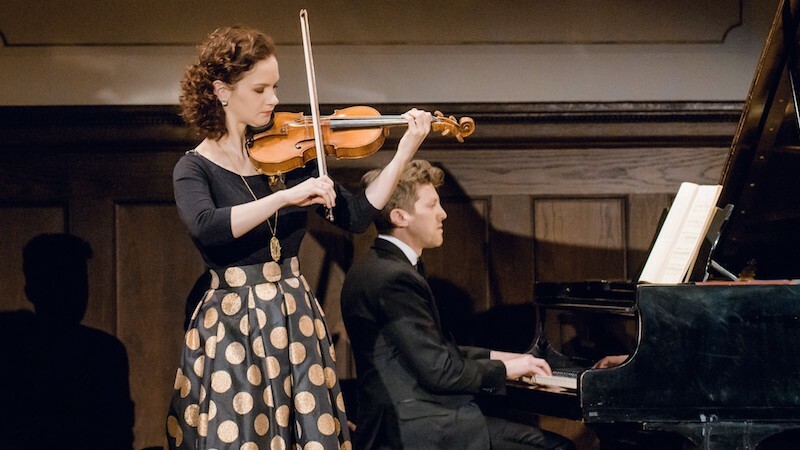 Hilary Hahn performs with pianist Cory Smythe, in a recital that was recorded direct-to-disc for "Retrospective." Photo by Stefan Höderath, courtesy Deutsche Grammophon. As DG describes the process: "While Hilary Hahn and Cory Smythe were performing works by Mozart, Turnage and Richter in Berlin’s Meistersaal, a stylus was cutting their interpretation directly into the grooves of the master disc. As a result, the recording could not be subsequently edited, remixed or modified in any way. The master discs produced by this process then served as the mold for the pressings. This means that every single LP is an identical analog copy of the original....Hahn is the first artist to present a direct-to-disc pressing on Deutsche Grammophon since the end of the shellac era." Not only that, but recording to a vinyl master, rather than a digital master, also meant that the tracks were permanently set. Once cut, an album side cannot be excerpted or changed. "So it was not even just that they couldn't edit, it also meant that what was on a side was a side," Hilary said. "It's the whole side, or nothing!" After the master was cut, "I got to sign the wax -- and it was very scary!" They told her not to go outside the lines, or she would ruin the entire side of the album. "So I was trying to write my name but not bump with my hands -- I basically scratched it in as a signature!" The remainder of the album includes selections from recordings made over a period of 15 years, from the time that Hilary was 23 until now. It includes a huge range of music -- for example, a movement from the Bach Double; Vaughan Williams' "The Lark Ascending"; a movement from the Violin Concerto that Jennifer Higdon wrote for Hilary (for which Higdon won a Pulitzer Prize); a movement from the Schoenberg Concerto and another from an Ives Sonata; a piece from her collaboration with Hauschka and more. Hilary actually chose all the tracks herself -- slightly different ones for the vinyl and CD formats. "At first I hadn't thought that I would pick tracks -- I thought, maybe we'll poll people and ask them to vote," Hilary said. "But then, as I listened through all the albums....it immediately became clear, which things that, for various reasons, belonged in this 'Retrospective.'" So how did she go about listening to 15 years' worth of her life's work, as recorded in 12 albums? "I listened back-to-back for two days - it was a little intense!" Hilary said. "It's like watching video of yourself for two full days straight. You go through all these different phases: curiosity, denial, acceptance, frustration, pleasant surprise -- all kinds of things. Any time you are looking directly at yourself -- metaphorically or literally -- for an extended period of time without a break, you're forced to come face-to-face with yourself." For Hilary, these were more than records. "For me, it's like looking at an old photo album," Hilary said. "Other people might see a picture, but you see everything about your life in that moment. There are all kinds of things that happen in any given year of one's life, positive and negative. You may feel glad, you may have regrets, you may have wistful moments or moments of gratitude for arriving somewhere new in your life -- and it all mixes together when you look at that picture in your photo album." When it comes to her records, "I wasn't just living in them with the recording sessions, I was living in them with post-production, the performances when they were released, the tours with the people that I recorded with, or the tours with other people with the same repertoire. There were the reactions to the records, then related things like Grammys or other ceremonies," Hilary said. "So much is tied to each record." "When I was thinking about visually how to represent the album, I thought -- what picture would represent all of that?" Hilary said. "And the one constant that I could come up with was the fan art," Hilary said. For many years, Hilary's fans of all ages have given her unsolicited works of art -- pictures they have drawn or painted of her, or pictures inspired by her music. She has featured those pictures both on her website and on her Facebook page. For the album she chose six pieces of art, pulling from the fan art she had collected as well as an open art call to fans for any new submissions. Featuring the art on an album cover -- especially something as big as a cover for a vinyl record, gave her a whole new way to display the art from her fans. "The art looks great, printed, so I thought: here is a chance to have it printed!" Hilary said. The cover art for both editions was drawn by Canadian graphic design artist Christine Fraser, who said that Hilary "has provided me with such a wonderful array of music that I frequently listen to while drawing or painting....music has always been a huge influence in my own creative process." Other works by fans were shown inside the booklet. "DG did a really nice job of continuing some thematic elements from the cover throughout the whole package, and showing the other artwork that is in side the booklet as well," Hilary said. All artists were compensated for the use of their work. Hilary was very pleased with the result. "It looks so good on the vinyl, it looks beautiful!" Hilary said. "I'm so proud of all the art that was submitted." Here is the link for buying Hilary's album, vinyl or otherwise. Ms. Hahn possesses absolute discipline and violinistic focus for a Lifetime stretch of her past, present and future body of work, which is familiar to all when speaking of Twentieth Century Giant's of Great Violin Playing & Art - Jascha Heifetz, Nathan Milstein, David Oistrakh, Fritz Kreisler & the unique Kreisler/Rachmaninoff Schubert Duo Violin & Piano alliance! January 20, 2018 at 02:29 PM · Beautiful article and beautiful reply. January 20, 2018 at 02:31 PM · Oh my. What a wonderful thing for HH to do. January 22, 2018 at 07:47 AM · I love vinyl. Really need to have this one.